Popchips Sea Salt and Vinegar- It's really funny but I've thought forever that I hated Salt and Vinegar chips. I just wouldn't touch them. But then Lays came out with those Dill Pickle flavored potato chips and I loved those. Salt and vinegar is really close to those, so I hesitantly tried a version. Aaand it looks like my tastebuds have changed and I *do* like salt and vinegar! These are good. They have that weird Popchip texture but the flavor is tasty. 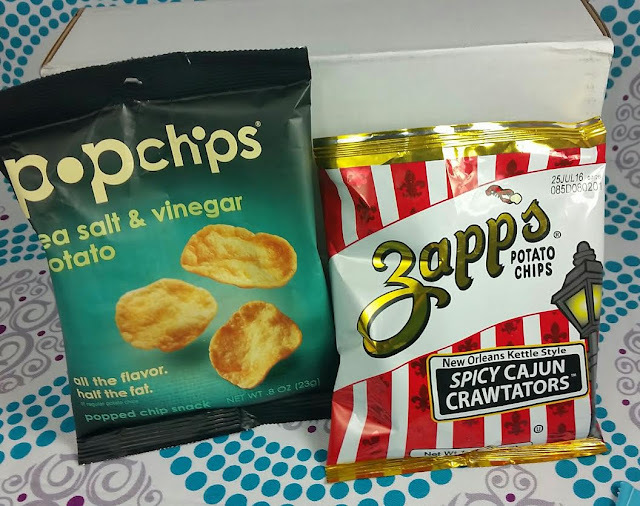 Zapp's Potato Chips New Orleans Spicy Cajun Crawtaters- Of course I tried these. They're a little spicy but it took me awhile to figure out what they taste like. They taste like chicken flavor Top Ramen. You know, that kind college kids eat when they're broke? Yep. Just like that powder packet. Except there's a spicy burn aftereffect. 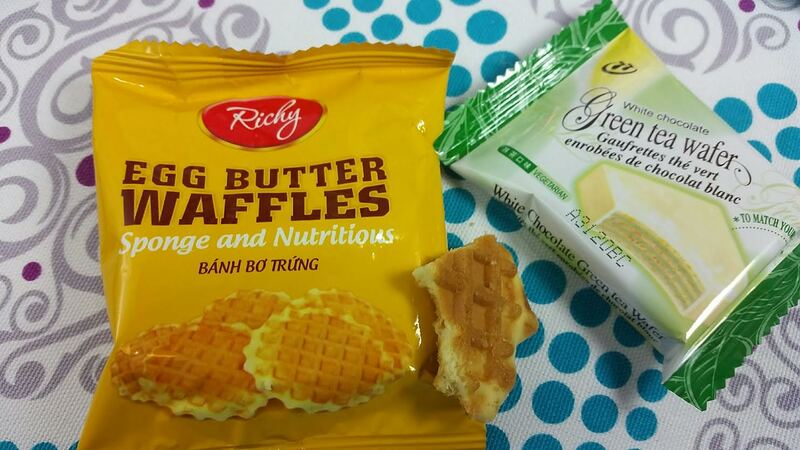 Richy Egg Butter Waffles- These are from Vietnam. I had to wait to try them until I could take a photo and it was killing me. These are tasty with a lot of vanilla. I like them better than those Stroopwafel things. Green Tea Wafer in White Chocolate- I've had these before although I can't remember where. Probably a Japanese snack box. I'm not a big fan of green tea anywhere except my teacup so I bestowed this upon my husband. 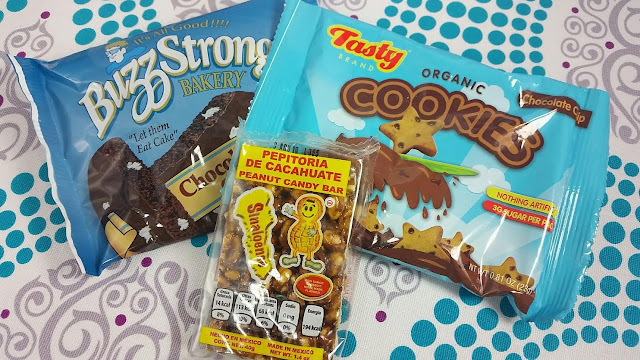 Buzz Strong's Bakery Chocolate Cake Cookie- This seems like a cafeteria brand but who doesn't like chocolate cake with vanilla frosting inside? I know I do. Tasty Brand Organic Star Cookies in Chocolate Chip- These are organic, tasty chocolate chip cookies. They were pretty crumbly but I ate them anyway. Pepitoria de Cacahuate Peanut Candy Bar- This is from Mexico. Which makes me think something spicy is possibly lurking inside this treat. It looks like granola bar. 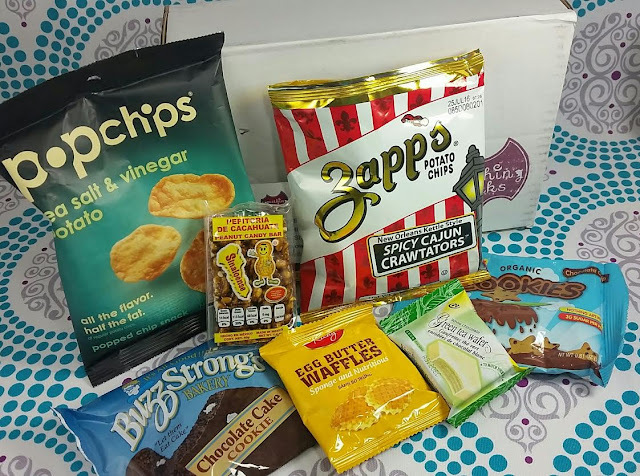 VERDICT: While this wasn't my favorite Something Snacks box, this is a nice mixture of product types. I'm looking forward to May's box which is themed "Fruit and Chocolate." With Something Snacks, I always appreciate that even if there's a healthy snack included there tends to be mostly fun, snackable foods. *This box was sent complimentary for review purposes, all opinions are mine.